Galaxie 500/XL SUNLINER Body Code 76B......13,183 produced. Suggested retail $3,518. Galaxie 500/XL Club Victoria, Body Code 65B...28,412 produced. Suggested retail $3,268. "Welcome to the lap of luxury"
Introduced in mid 1962 production year, the Galaxie 500/XL was among the first impacts of newly named Division General Manager Lee Iacocca. The strategy was to go after the Baby Boomer youth with "Total Performance" from Ford. The Galaxie 500/XL came equipped with a 4 speed manual transmission with console mounted stick shift, or the three-speed Cruise-O-Matic again with console mounted shift lever. The standard engine for this sporty machine was the 292 Thunderbird V-8, with optional choices being the Thunderbird 352 Special, Thunderbird 390 Special, Thunderbird 406 High Performance, and Thunderbird 406 Super High Performance V-8's. See the options page for more info on these engines. 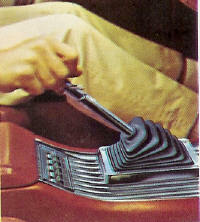 The 4 speed stick was available with all the special V-8s and was required on the 406 V-8's. "XL cockpit...functional as a sports car"
On the outside the Galaxie 500/XL differed little from other Galaxie 500s. The " XL " was added to the rear quarter script and to the rear trim gas cap door. The "cockpit" was the real difference. "...Elegance everywhere!" 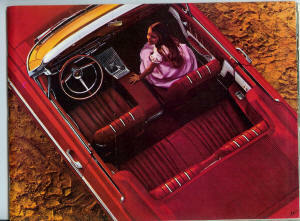 The "command console" and deep pleated mylar trimmed bucket seats create a sporty, beautiful and comfortable interior. XL - What does it stand for? A question that pops up from time to time at shows, Ford internet sites and discussion groups is "what does the XL in Galaxie 500/XL stand for?" As yet, no one has been able to nail down as documented fact just what it does stand for. The introductory brochure printed in Feb. 1962 emphases two "L" words, Lively and Luxury. "Live it up...with the Lively Ones from Ford." "Luxury with a sports car lilt..." "The last word in spirited sports model Luxury in every price range." "Galaxie 500/XL...Queen of the Lively ones from Ford." So, Xtra Lively, Xtra Luxury or something else entirely, who knows, could be both, or neither. Since Lee Iacocca was behind the development, and the XLs are so very cool inside, maybe it simply stands for "Xcellent Lee!!" Ford would continue to produce the Galaxie 500/XL until 1970. 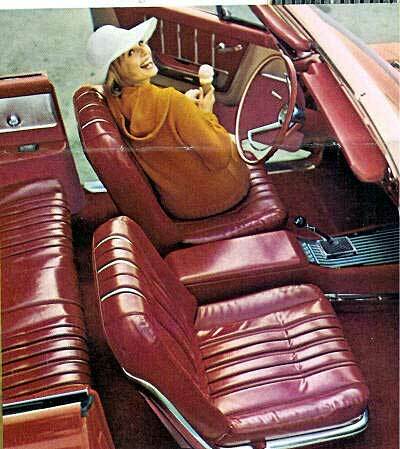 However, for the 1968 model year the console and bucket seats that had been the defining signature of the XL were changed to an extra-cost option at $104 and the XL could be purchased without this sporty interior. Registry Note: It has been reported/suggested, and discussed on some websites, that the first Galaxie 500/XLs, those built in March and/or April of 1962, were assembled at Ford’s Lorain, Ohio plant. The reason given for this is that the Mercury line at Lorain moved slower than the other assembly plant lines and this made it easier to assure quality of the many changes in the soft trim of the XL interiors. The Registry is aware of no official documentation to support this claim, and Michelle Wingard’s December 19, 2005 article Lorain Assembly Plant Model History in the Blue Oval News makes no mention that Galaxie 500/XLs were ever built there, nor can any other Ford experts support the claim. According to Michelle's article, the Lorain Assembly Plant operated from 1958 until it was closed on December 14, 2005. The plant did assemble Galaxies but only 1959 models in 1958 and 1959. The Registry is very skeptical, but open minded, regarding the claim of early XL assembly. The Lorain Plant was not equipped to assemble Galaxies in 1962, and the Mercury line there built Comets, not full size cars, so the workers would have not been trained in Galaxie assembly. These Galaxies would have had to have been transported there in pieces and this makes no sense. The XL interiors certainly had many changes from the standard Galaxies, but none so complex that it would require the effort and cost of starting their assembly, especially temporarily, at a plant that wasn’t equipped to handle them. The only significant assembly difference for the XLs was the installation of the bucket seats and console which was no big deal. None of the Galaxie 500/XLs in the Registry thus far show a Lorain Assembly Plant code of H. The earliest XL in the Registry, entry number 61, has a date code of March 19, clearly one of the first XLs, and that car came out of the Mahwah, New Jersey plant. None of the XLs with April date codes show a Lorain Plant code either. If it is true that some of the first XLs were assembled at Lorain, this registry considers it important historical information regarding the birth of the Galaxie 500/XL. So, if anyone can shed documented light on this subject, please contact me. Until that documentation is provided, this registry considers the claim to be an unsubstantiated automotive myth.